You know when you say a word over and over again and it starts to lose meaning? I think Jackson Ferrell from Sketch Comedy managed to do that with this guest comic. There’s actually a subtle brilliance Jackson was able to communicate with this strip. I’m a big fans of comics that can deliver a joke using tone. Trust me, it’s a hell of a lot more difficult that writing a fart joke. But Jackson managed to do it with facial expressions and a few expertly placed pieces of punctuation. What’s more, is that he pretty much encapsulated the 10-year narrative arc of Theater Hopper in just one comic. No mean feat. 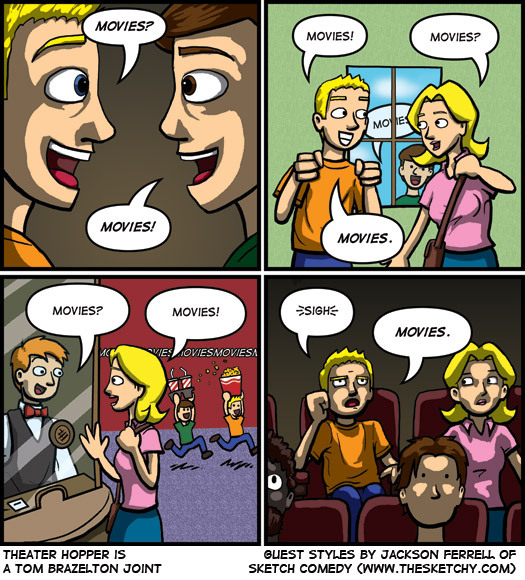 If nothing else, I just love Tom and Jared in the background of panel three yelling “MOVIESMOVIESMOVIESMOVIESMOVIES.” It rips me up. Be sure to check out Jackson’s comic Sketch Comedy as a reward for his hard work. I think you guys will like what you find there. Thanks again, Jackson! Loved the comic! I also love the background of panel three. It’s like a more ecstatic, movie-themed version of Super Mario 2. I’m now looking forward to a comic about “Stayputies”.